Improved indoor air quality is a major issue facing the HVAC industry today. The air movement industry has been very effective in the areas of human comfort and the removal of particulates. However, to totally “clean” the air; the gases and vapors – the chemical pollution that affects heath and productivity – must also be removed. For HVAC applications, adsorption is the most effective and the most economical process. Activated carbon, known as the universal adsorbent, is the most effective means of cleaning the air we breathe. A variety of products utilizing activated carbon are readily available. Many have been in use for decades and have proven to be effective in eliminating the chemical pollution found in HVAC systems. Theoretically, we can remove almost all particulate matter from an air stream. In order to remove the chemical pollutants from gases and vapors, HEPA filtration is the most effective means. HEPA filters can remove particulates in the 0.3 micron range and below. Gases and vapors are .01 microns and smaller. Benzene and naphthalene, two compounds that are strongly adsorbed by carbon, are approximately .0006 and .0007 microns respectively. One micron equals 1/25,400 of an inch. Very simply, particulate filters do not and can not remove material that is this small and is a gas. Adsorption with activated carbon is therefore the process of choice for applications when vapors are present in low concentrations. For all HVAC applications, where the concentrations are extremely low and the contaminant loading varies constantly, adsorption has proven to be the most effective and the most economical means. Activated carbon is truly a unique material. There are no other materials, natural or man-made, that will do all that it will do. Activated carbon is known as the universal adsorbent. Why Is Activated Carbon Used As The Adsorbent With Hvac Processes? Has a capacity for virtually any vapor contaminant; it will adsorb “some of almost any vapor”. Activated carbon has enormous surface area: 5 million square feet of available surface area per pound of carbon. Utilizing a maximum “working” capacity of 33%, up to 1,650,000 square feet is available for adsorption. There are many types and grades of carbon that can be used for adsorption. There are carbons used for liquid and gas phase applications; they are not interchangeable. Gas phase carbons are used for general HVAC applications. The commercial quality HVAC carbons that are manufactured today are produced from either coal or coconut shells. Petroleum based carbons are still in use, however since they are all reactivated materials, their usage has been declining. These materials are interchangeable, as long as the activity level and the average particle size are the same. The HVAC industry is currently using 60% minimum activity carbons, which are either 6/8 mesh (3 mm) palletized or 6/12 mesh granular. Air streams with hundreds to thousands of parts per million (ppm) of gas molecules are recovered, or removed, with beds that can be several feet thick and contain thousands of pounds of carbon. For HVAC applications, thin bed filters with comparatively small amounts of carbon are utilized. For the majority of these applications, the air to be treated is a combination of air-entering (Make-up air), and air that is recirculating. The gaseous contaminant loading is always a combination of many odors and chemical pollutants. As it is normally unknown either as to the chemical make-up, the amount of each pollutant, or total loading, activated carbon is the perfect material to remove all of the contaminants present. Carbon must be changed on a regular basis. This regularity, which should be established during the first year of operation by utilizing test samples, will insure that the carbon remains effective all year round. Farrar Filter Company tests all types of gas phase carbon at our in-house laboratory. Contact us for information on testing samples from carbon beds. 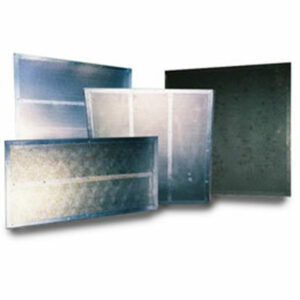 Panel filters, _” to 3″ in thickness with perforated face plates. These panels will hold approximately 4.5 to 30 pounds of carbon, dependent on size and filter area size. Panels are installed in a “V” configuration in continual tracks within an HVAC unit. Panels are installed in a filter housing specifically designed to hold an mount of carbon filters that meets the CFM requirement of the application. V-type cells and extended surface filters offer 30 to 45 pounds of carbon per 1000 CFM of air to be treated. These filters are either installed in their own individal housings or on continual tracks within HVAC units. Honeycomb filters usually 2″ with either a partial or full bed of carbon and a thin net containing the carbon. These filters may be used for controlling minor nuisance odors. Pleated filters, usually 2″ in thickness, has pleated media which is a fabric material impregnated with powdered carbon. These may be used in place of standard HVAC pleated filters where there is a problem with musty odors. Activated Carbon Tanks are used for treating heavy concentrations of odors, as may occur in fragrance factories, sewage treatment plants, etc. The tank may hold anywhere from 500 to 10,000 lbs. of granular activated carbon. Activated Carbon Drums. These drums are rated at 100 to 300 CFM depending on the drum size and amount of carbon used. They are constructed with 2″ inlet and outlet ports. The air enters the drum through the bottom inlet and travels up through the bed of carbon, leaving the drum through the outlet port in the center of the lid. The application of these products can be divided into two areas – either new construction or retrofitting existing installations. When a new structure is being designed, the engineer has the option of utilizing any of the above products. When odor control applications arise in existing installations, panel filters, although they will need to be changed more frequently to offer similar capacities, offer the advantage of interchangeability, thereby elminating the need to alter the existing air handling system. ORGANIC COMPOUNDS: Acids, Alcohols, Aldehydes, Chlorinated Hydrocarbons, Esters, Ethers, Ketones, Mercaptans, Amines. INORGANIC COMPOUNDS: Halogen Acids, Halogens, Sulphuric Acid, Sulphur Dioxide, Phosgene. MISCELLANEOUS ODORS FROM: Humans, Animals, Foods, Cooking, and Waste Processes. Homes, pet hospitals, pet groomers, medical laboratories, nursing homes and health care facilities. In conclusion, the removal of chemical contaminants which affect the health and productivity of many Americans at work and at play can be accomplished through the application of activated carbon technology. When properly applied and maintained, your carbon system will eliminate the vast majority of pollution problems caused by the gases and vapors – the chemical pollution – found in HVAC systems. Contact Farrar Filter with any questions or inquiries involving activated carbon products for your HVAC application. Our design engineers and staff are ready to assist you with your needs! We offer a full line of housings, panels, trays, V-banks and carbon tanks for every application. We design, build, service and deliver to you or your customer!